The Wat Pa Maha Chedio Kaew temple has found a way to bottle-up Nirvana, literally. 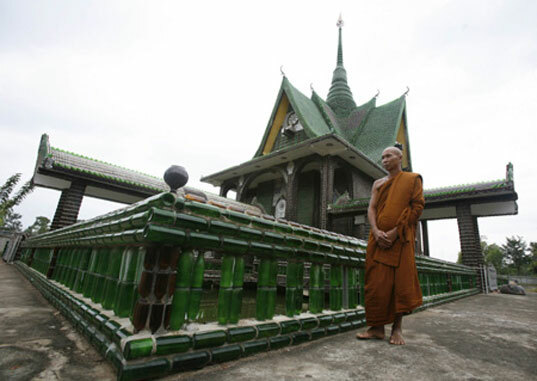 The temple, which sits in Thailand’s Sisaket province, roughly 370 miles northeast of Bangkok is made of more than a million recycled glass bottles. 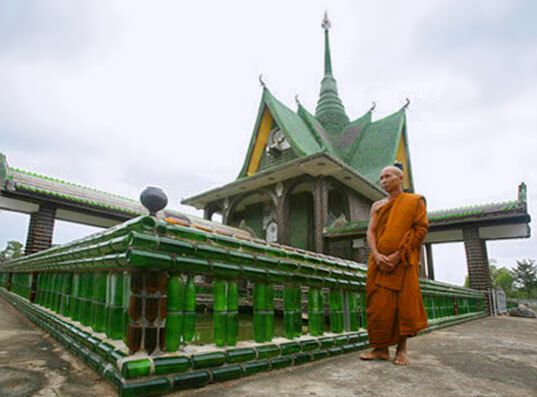 True to its nickname, “Wat Lan Kuad” or “Temple of Million Bottles” features glass bottles throughout the premises of the temple, including the crematorium, surrounding shelters, and yes – even the toilets. There’s an estimated 1.5 million recycled bottles built into the temple, and as you might have guessed, they are committed to recycling more. After all, the more bottles they get, the more buildings they are able to construct. This would get soooo vandalized over here. don't do this near forest !!! good site . i like it. Wow, that is absolutely amazing! I hope to visit it one day. Juliebootie - what province is it in? I'd like to visit it . Wonderful designing - the word \'recycling\' may not apply for this since bottles are used \'as it is\'. Very nice. i have also been to this temple...its amazing! I have actually been to this temple in and it is amazing how many bottles are used. The designer came up with a great concept that I am sure is bringing in plenty of donations! Wow, That is cool. I can see a whole new revolution in building, Instead of a staw bales house I am totally building a glass bottle bale house. What happens if one breaks? Nice to know of this. I live in Thailand myself, and I never even heard of this temple.